Celebrate the 4th of July with Grand Ol’ 7s coming soon to H5C! Independence Day is almost here and we want to share a few fun facts with you in celebration! The Declaration of Independence was signed 241 years ago today in 1776 by John Hancock! The first Independence Day celebration took place in 1777 in Bristol, Rhode Island and Philadelphia, Pennsylvania! In 2016, approximately 155 million hot dogs were consumed at BBQ’s on the 4th of July! In 2016, 285.3 million pounds of fireworks were used to celebrate! 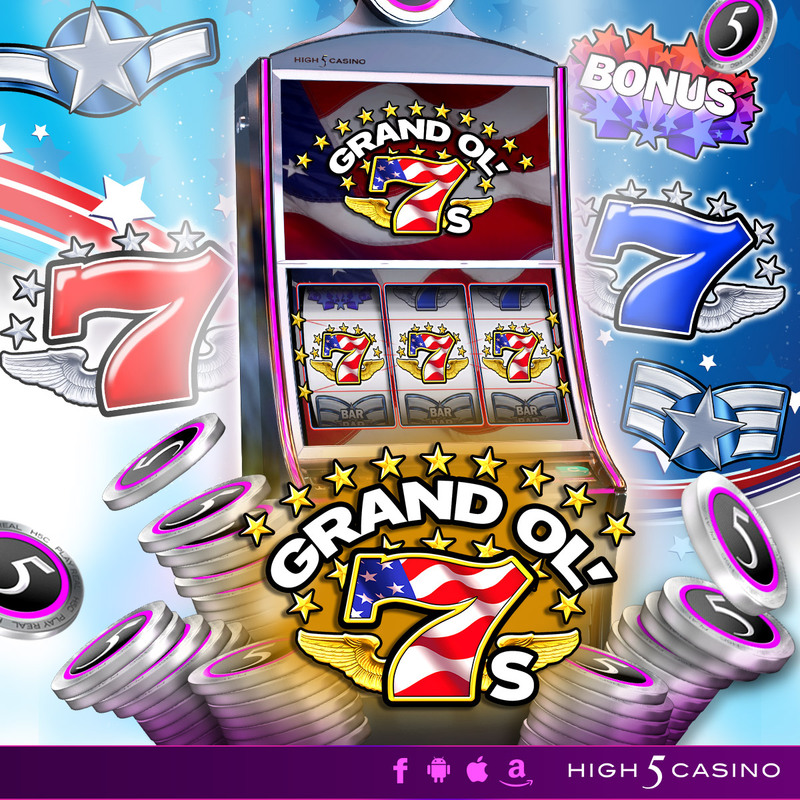 Whether you’re celebrating the holiday with a BBQ or catching a fireworks show, it’s time to get ready for High 5 Casino’s 207th game Grand Ol’ 7s arriving soon! Grand Ol’ 7s gives High 5-ers the opportunity to celebrate Independence Day ALL YEAR ROUND! A classic 3-reel slot, you don’t want miss out on your chance to hit star-spangled wins in the Matchmaker Bonus. 3 by 3 reels. 5 paylines. Mixed 7 Wins and the Matchmaker Bonus… we got you covered for the holiday! Grab your American flag and get ready for some HUGE red, white, and blue wins on your High 5 Casino Reels! Are you ready to celebrate with Grand Ol’ 7s? Comment in the conversation bubble located on the top right corner of your screen and let us know! This entry was posted in game preview, Game Release, High 5 Casino, High 5 Games, High 5 Moments and tagged 04/07/2016, 07/04/2017, 2017, 3 by 3 reels, 4th of July, 5 paylines, Android, App Store, Apple, Facebook, Free Games, game preview, Game Spotlight, Google Play Store, Happy 4th of July, High 5 Casino, High 5 Casino Mobile, High 5 Games, Independence Day, iOS, iPad, iPads, iPhone, iPhones, July 4, Mixed 7 wins, mobile gaming, slots, social gaming by hoothigh5. Bookmark the permalink. Always honor the veterans with the 4th of July Celebrations, however a good friend, Air Medic Sharon Faulkner was killed in an air ambulance accident on this date 7 years ago. Sometimes celebrating is not the best.